Clean your poly furniture regularly with a non-abrasive soap and water to ensure the continued beauty of your furniture. While most of Leisure Lawns colors will only need to be cleaned a few times a year, colors like white, gray or ivory and other of our lighter colors will need to be cleaned more frequently to maintain their original beauty. With our lighter colors, spray the furniture with a non-abrasive cleaner then wipe the furniture with a cloth and rinse off with warm, clean water. We would not recommend using a pressure washer. But if you choose to use one, do not hold the pressure washer too close to the furniture. It may cause the material to tear away so be sure to hold the top more than 12″ away from the furniture. Do not place items on the furniture that will leave a stain. Do not place hot items directly on the furniture. If properly cared for, you will be able to enjoy your poly furniture for many years! Poly Lumber is manufactured to be resistant to corrosive substances, oils and fuels, insects, fungi, salt spray and other environmental stress. To maintain the original finish, clean the poly with soap and water. No sealing or painting is required; as a general rule, paint will not adhere to poly. Colonial Road Woodworks, LLC (hereinafter “CRWW”), warrants to the original purchaser, that for the period of twenty (20) years of residential use or five (5) years of commerical use from the date of original purchase, that its high-density polyethylene (HDPE) outdoor furniture shall be free of manufacturer defects in workmanship and materials unless otherwised noted in warranty. CRWW will replace or repair the product without charge for materials and labor, providing that our inspection indicates that a manufacturer defect exists. Should CRWW choose to replace the product, and the product is no longer being made by CRWW, a substitution of similar performance and equal or greater value will be made. CRWW HDPE products are made with UV inhibitors to minimize fading, however upon prolonged exposure to the sun all colors will fade to some degree. CRWW stainless steel fasteners are warranted to not fail structurally for the applicable warranty period. Hardware such as gliders, swivels and brackets are only warranted for two (2) years. If not maintained, stainless steel may corrode in certain extreme conditions (coastal areas). Damage caused by unauthorized service or repair, alteration of the product, normal wear and tear on materials, abuse or misuse, or abnormal use of the product shall void this warranty. 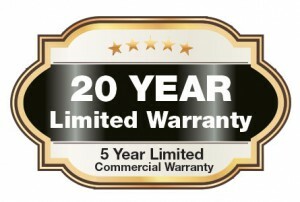 This Limited Warranty is in lieu of all other warranties either expressed or implied. Contact us at leisurelawnscollection.com or email to crww@pcfreemail.com To place a claim, explain the nature of the original defect and include your name, address and telephone number. In event of non-warranty repair, you will receive an estimate prior to any repair work being done.